Hard to believe the election is just three months away, and the alert is especially valuable for residents of Aurora, who this year have to get acquainted with a new voting system in the wake of the dissolution of the Aurora Election Commission. In March, voters said yes to a referendum that ended the AEC, and put voting commission responsibilities in the hands of Kane County clerk’s offices or countywide election commissions. The final tally was 6,476 “yes” and 5,060 “no” to the proposition. The Clerk’s Office has posted two new videos to help voters from Aurora get acquainted with the e-Slate voting system. #ElectionDay is 3 months away. Is your #voter registration information current? Find out at https://t.co/zlK3xE8fDF. eSlate™ is direct recording equipment (DRE). This means that it is an electronic device that directly records information. 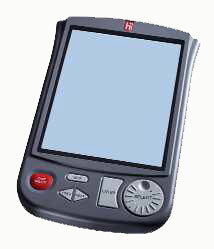 eSlate™ itself is very similar to a large handheld computer device. The voter uses a rotary wheel to navigate through the ballot and select his or her vote. This rotary interface was chosen because it is more accurate and durable than touch-screen systems. In 2003, Kane County put together a team to explore new alternatives to punch card voting. A request for proposal was issued and submitted to many vendors. After the bids were received and reviewed, the Kane County Board determined that eSlate™, provided by Hart Intercivic was the best choice for Kane County. This decision was based on overall cost, security, ease of use by the voter, and compliance with Federal and State law. eSlate™ has been proven secure, accurate, and durable. It is easy to use and accessible to all voters as well as cost and time efficient. The process for voting hasn’t changed, just the device you are using to vote. When you go to the polls, you will still sign an application as always. Once you have signed your application, instead of receiving your punch card, you will receive a piece of paper with a four digit number on it. ou then take the piece of paper with you to any one of the voting booths. You will then enter the four digit number into the eSlate™, the appropriate ballot will appear, and you will then vote the ballot.